Chris and I had never made it to California together, and we took advantage of some free air miles we had lying around to make the six-hour trek. Since it was my first time the state, I knew I wanted to experience the vast natural beauty this area of the USA had to offer. Back home, while we have gorgeous landscape, we have nothing that compares to the rugged Cali desert. One thing about heading down to this part of the country is there are so many options to choose from for accommodation. I did a lot of research on to find what would fit our needs, and we were not disappointed. The Joshua Tree House is tucked away on a side street in Joshua Tree, California. 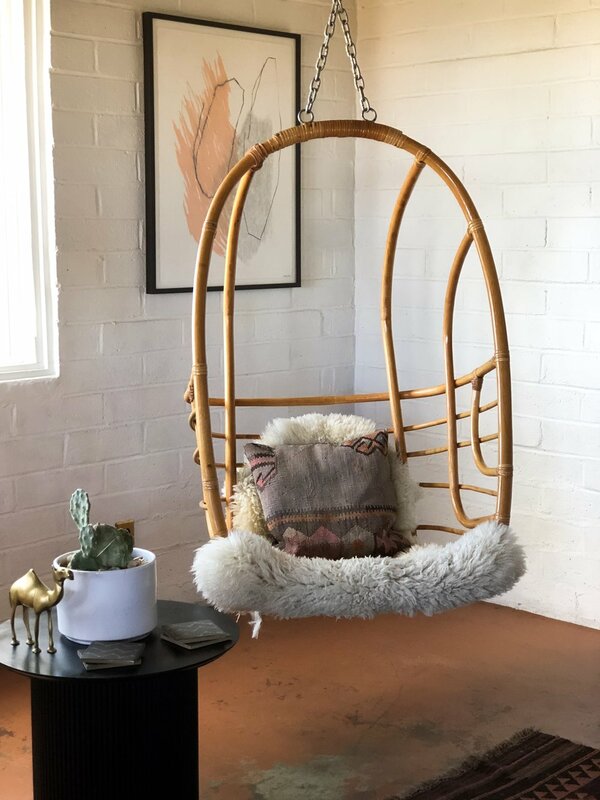 It is owned by the wonderful Sara and Rich Combs, and is the perfect place to stay if you are wanting to experience the natural beauty of the desert, as it is about 15 minutes from the entrance to the Joshua Tree National Park. We had spent the whole day hiking in the national park, so it was refreshing not having to drive a long distance to our accommodation afterwards. Our initial reaction to the house was a magical one. The outside felt untouched with cacti and other native plants strewn throughout the property. Stepping onto the porch, there was a little seating area calling my name to take in the coming sunset. As we walked into the interior of the house, I noticed the inside was just as beautiful. A wide array of textures awaited for my eyes to get lost in, yet still with a minimalistic feel throughout the home. There were crystals tucked in every corner, a vintage record player with records to listen to, and some board games to use. We took the evening to lounge and take in the scenery. As we stared out the window as the sun disappeared behind the desert landscape, we noticed a family of quail hanging out around the front yard. We continued to watch them until dark set in, which was the perfect time to move to the back of the property. We soaked in the hot tub and gazed up at the stars in the pure darkness that encompassed our surroundings. The sky in the desert gives a pretty good show. As we retired to the bedroom, I found yet another thoughtful touch. There was water placed next to the bed, and an air conditioner to control the bedroom temperature without un-necessarily cooling the whole house as we slept. When morning came, I woke up early, feeling rejuvenated. I meandered to the kitchen, and pleasantly found a setup for some drip brewed coffee. I embraced the morning light as I walked through the house and out into the second bedroom, which has its own entrance. Perfect for couples vacationing together. I took some time to meditate in the natural light through the bright window of the bedroom before getting ready for another day in the desert mountains. 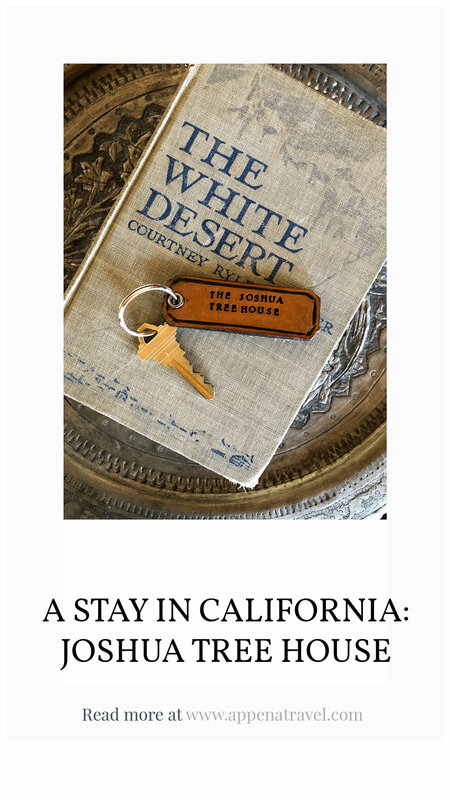 Highly recommend this place if you’re headed out to Joshua Tree for a getaway. The owners also have other properties for rent, which look just as amazing, and I fully plan on experiencing when we visit again next year. Also, make sure to check out their website. They upload a “New Moon Playlist” every month, which I have found some great artists through. You can also follow them on instagram for more interior inspirations.